The VAW-112 'Golden Hawks' fly the E-2C Hawkeye out of NBVC Ventura County, Point Mugu, California. They were established in April 1967 and serve aboard the USS Stennis (CVN-74) as part of CVW-9. This is the color version of their squadron patch worn on the right breast of the aircrew's flight suits and jackets. The VAW-112 'Golden Hawks' fly the E-2C Hawkeye out of NBVC Ventura County, Point Mugu, California. They were established in April 1967 and serve aboard the USS Stennis (CVN-74) as part of CVW-9. This is the blue version of their aircraft patch worn on the right sleeve of the aircrew's flight suits and jackets. The VAW-112 'Golden Hawks' fly the E-2C Hawkeye out of NBVC Ventura County, Point Mugu, California. They were established in April 1967 and serve aboard the USS Stennis (CVN-74) as part of CVW-9. This is the desert version of their aircraft patch worn on the right sleeve of the aircrew's flight suits and jackets. 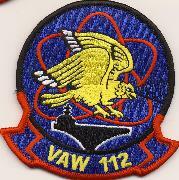 Homepage | Order VAW-112 Patches!